Over the weekend, Roku fans had a reason to celebrate when the Google Play Movies & TV app was added to their channel selections through which they could have the leisure to directly purchase or rent TV shows and movies. Which puts to shame how Apple offers this stuff via its iOS ecosystem. For both Roku and Google, the move was a win-win deal. On the side of Google, the partnership with Roku opens a vast market opportunity to offer its streaming-video service to Roku’s at least 10 million users. That will certainly boost the search giant’s revenues from streaming sales. 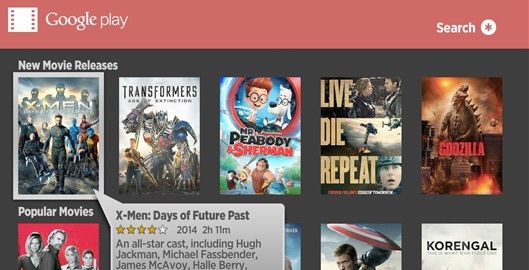 On the part of Roku, the addition of Google Play Movies & TV to its selections makes the set-top even more attractive to potential customers who are looking for a broad variety of options. On the other hand, it will mean that Roku and Google are taking on with another giant, Amazon. Amazon’s recently unveiled Fire TV set-top box shows off voice-control systems and optional gamepad accessories that are the same in almost overall appearance with the one built by Google. However, the two products differ in the variety of apps available through their channel selections. At the same time that Google launched the Play Movies & TV app on Roku, the Mountain View titan also introduced a new streaming box that is sure to outshine Roku as far as features are concerned. The Nexus Player, to be offered for $100, runs Android TV, which Google hopes to win adoption by TV makers over the coming years and be made the platform for developing applications to run on various TV sets. While Roku, with the enhancement from Google Play Movies & TV, is now all set to crush down the Amazon Fire TV, Google’s Nexus Player seems a stronger killer for Roku. Consider that Roku’s strength is mainly backed up by the broad selections of its channels and content and the simple design. Add to that its seasoned platform. On the other hand, the Nexus Player might not have been proven yet as to how far it can exceed Roku and Amazon Fire TV. But certainly, its feature to clone the feature of Chromecast with even more nifty functions makes it a Roku and even Chromecast killer. Google’s Nexus Player is designed to enable users to stream movies and TV shows from their Chrome browser through corresponding apps on their mobile phones. The stream also features a remote control and an onscreen user interface through which users can do the streaming directly. With Chromecast, they will have to bring movie and TV content from a mobile device where they perform the streaming and not on TV.